Architect, furniture designer, interior designer, entrepreneur — Florence Knoll had a subtle but profound influence on the course of mid-century American modernism. Dedicated to functionality and organization, and never flamboyant, Knoll shaped the ethos of the post-war business world with her polished, efficient design and skillfully realized office plans. Knoll had perhaps the most thorough design education of any of her peers. Florence Schust was orphaned at age 12, and her guardian sent her to Kingswood, a girl’s boarding school that is part of the Cranbrook Educational Community in suburban Detroit. Her interest in design brought her to the attention of Eliel Saarinen, the Finnish architect and head of the Cranbrook Academy of Art. Saarinen and his wife took the talented child under their wing, and she became close to their son, the future architect Eero Saarinen. While a student at the Academy, Florence befriended artist-designer Harry Bertoia and Charles and Ray Eames. Later, she studied under three of the Bauhaus masters who emigrated to the United States. She worked as an apprentice in the Boston architectural offices of Walter Gropius and Marcel Breuer; Ludwig Mies van der Rohe taught her at the Illinois Institute of Technology. In 1941, she met Hans Knoll, whose eponymous furniture company was just getting off the ground. They married in 1946, and her design sense and his business skills soon made Knoll Inc. a leading firm in its field. Florence signed up the younger Saarinen as a designer, and would develop pieces by Bertoia, Mies and the artist Isamu Noguchi. Her main work came as head of the Knoll Planning Group, designing custom office interiors for clients such as IBM and CBS. The furniture Florence created for these spaces reflects her Bauhaus training: the pieces are pure functional design, exactingly built; their only ornament from the materials, such as wood and marble. Her innovations — the oval conference table, for example, conceived as a way to ensure clear sightlines among all seated at a meeting — were always in the service of practicality. Since her retirement in 1965, Knoll received the National Medal of Arts, among other awards; in 2004 the Philadelphia Museum of Art mounted the exhibition “Florence Knoll: Defining Modern” — well deserved accolades for a strong, successful design and business pioneer. As demonstrated on these pages, the simplicity of Knoll’s furniture is her work’s great virtue: they fit into any interior design scheme. Read more about Florence Knoll in Introspective Magazine. A walnut credenza with bronze base/hardware and travertine top. Designed by Florence Knoll for Knoll. 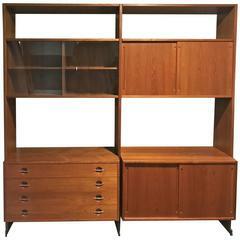 Classic walnut and lacquer sliding door credenza by Florence Knoll. Original leather pulls.